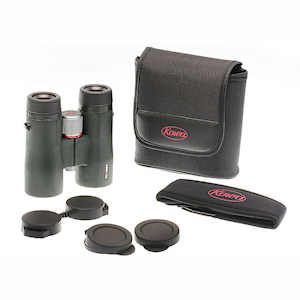 Kowa BD42 10x42 XD binoculars are made with Kowa's Prominar XD lenses for maximum contrast and almost no chromatic aberration. The high quality roof prisms are phase-coated and feature Kowa's proprietary C3 reflective coating. The 10x42 BD42-XDs boast a 324-foot field of view at 1000 yards, a 4.9-foot minimum close focus, and 18 mm of eye relief. 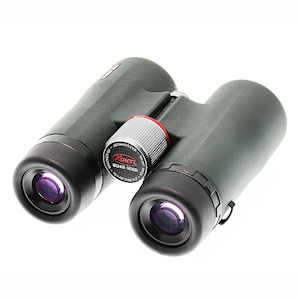 Made with lightweight but durable magnesium chassis, Kowa's BD42 XD binoculars weigh a mere 23.1 ounces. Kowa's BD42 10x42 XD binocular is rubber armored, waterproof and fog-proof. Field of View: 324 ft. at 1000 yds. Dimensions: 5.2 x 5 x 2 in. 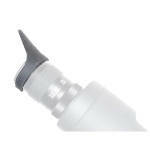 Product Weight (oz): 23.1 oz.